(Newser) – Sen. Bernie Sanders on Saturday returned to Brooklyn, his birthplace, for the first rally of his second presidential campaign and sought to tie his working-class background to his populist views that are helping reshape the Democratic Party, the AP reports. He predicted he would win the nomination in a field of now-double digit rivals and then defeat President Donald Trump, "the most dangerous president in modern American history." After falling short in 2016 against Hillary Clinton, the Vermont independent told supporters at a rally at Brooklyn College, which he once attended, that his campaign is saying "loudly and clearly that the underlying principles of our government will not be greed, hatred, and lies. It will not be racism, sexism, xenophobia, homophobia, and religious bigotry. That is going to end." Sanders pledged to fight for "economic justice, social justice, racial justice, and environmental justice." He had begun his 2016 campaign in Vermont, which he has represented in the Senate for nearly two decades. 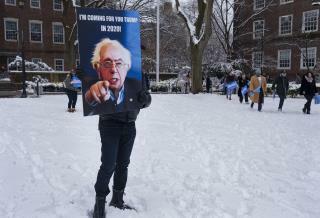 But this time, as he tries to showcase more of his personal story, Sanders kicked off his 2020 bid in the New York City borough where he grew up as the son of a Jewish immigrant and lived in a rent-controlled apartment. Campaign priorities include "Medicare for all," a $15-an-hour minimum wage and addressing climate change. And Sanders is focusing on his working-class roots and how his family's financial struggles have shaped his views. In those reflections is an implicit contrast to another New Yorker, Trump, a billionaire who hails from Queens. Bernie couldn't beat himself out of a paper bag..
Why does he kept running for nomination from a party that rigged it against him?